An interview with Dunya Kamal, Global Communities Officer at Amnesty International about their use of social media to further their cause. 1. How has social media changed the way Amnesty International communicate? We’re able to inspire people to take injustice personally, in a very direct and organic way. Being the largest human rights organisation in the world means we need to be sure that we are engaging in the conversations our audience talk about, and providing them with content that they care about, relate to, and want to get involved in. It’s massively changed the way we communicate! We’re now creating content specifically for social media e.g. videos for Facebook, and we’re understanding our audience so that we can remain relevant. 2. 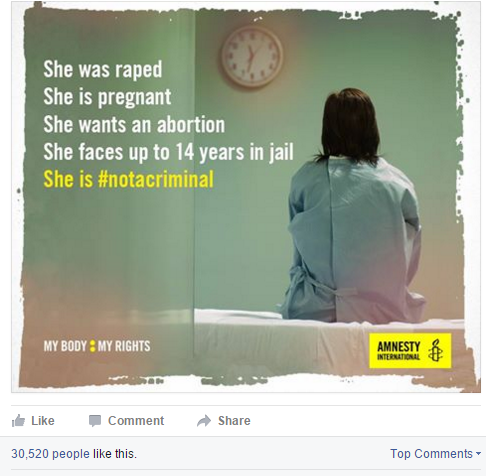 What is Amnesty International’s most successful campaign on social media? When we launched our Ireland report and campaign back in June 2015, we were hoping to get an impact with some really powerful graphics our in-house designer created. We weren’t expecting to break our own personal best, with it having the biggest engagement on Facebook for a single post that any of our campaigns has ever achieved (record petition signups in the first week at 15,000, too!). Its success was down to a few factors: the content itself was demanding Ireland change its abortion law; the timing was just after the Marriage Referendum success, so many of our users were commenting with the feeling that ‘if the #MarRef happened, it’s about time we got around to this too’. We’ve also had success with a short-running campaign targeting Shell to clean up the Niger Delta, on Facebook, Twitter and Instagram. The focus on this one, in contrast, was Twitter, hijacking Shell’s own hashtag ‘#makethefuture’ and asking our audience via the website and our tweets, to target Shell. 3. How do you measure the success of your social media channels? What metrics do you use? Success isn’t a tangible thing – it really depends on what the objectives are. Clearly, if we’re growing across channels, and our engagement numbers are high, we’re on the right track. We use Sprinklr, a social media management tool and platform for a lot of our data capture on social. If part of a campaign is to overload a government official’s Twitter account with mentions, then what we’re focusing on is the pick-up of a specific hashtag or how many people tweet him/her, as opposed to the number of retweets our own tweets receive. Our Data and Insights Analyst is doing an amazing job, setting benchmark figures for our channels in general, projecting what our growth should be by a certain point, and looking at what type of content our audience engages with the most. Adapting our content so that we’re constantly listening to what our audience wants, is a great way to at least ensure you’re always on the right side of success. 4. How does social media help you connect with the media? Social media is great for bringing breaking news to the people you want to see it – namely press on Twitter. Any time a crisis proliferates, the media team and myself jump on Twitter to get an idea of the content being shared, what the tone of voice, angle, attitude is on the issue. I like to keep an eye on trending hashtags to ensure we are inserting ourselves into the conversation appropriately, and we have a separate press Twitter account that focuses on sharing content most appropriate for journalists and media across the world. Like everything else, social media has made that line to media more direct and therefore much quicker, so not only can we disseminate information (especially breaking news) in effective ways, but we are also able to respond to and see what other news outlets are doing. 5. What is the most important ingredient in a social media strategy? Understanding your audience. A well-written, coherent strategy is only as valuable as what it delivers. You need to be able to listen, on each platform, to what your audience wants, as well as what kind of content they are engaging with on their social channels (which may have nothing to do with Amnesty!). 6. How do Amnesty International use social media for human rights monitoring? This predominantly occurs in Twitter, which is an extremely powerful tool for those wishing to document abuses or simply get their story heard. Once I spot something on social (using Topsy for example, sometimes our tool Sprinklr) that seems like it is gaining traction or exploring a human rights abuse, I send a note to the relevant researcher or campaigner to flag to them what I’ve been seeing online, but also to get an understanding from them on what they’re doing – most of the time they’re keeping a watch on the situation, are looking to verify sources, and sometimes there’s an upcoming report or briefing on the issue. 7. What concerns do you have about social media? The only major concern we have is sharing information too early – sometimes we need to be sure we have verified what we’ve seen on social, which might delay our response or voice on the issue, but is crucial to ensure we don’t say anything that isn’t true. Information is provided to the researchers, who may then need to speak to our law and policy department, but the verification of information comes from a number of sources across the organisation and at this point it would be out of my hands, I’ll hear back if something has been checked and verified, but usually this stage is more focused on information gathering. 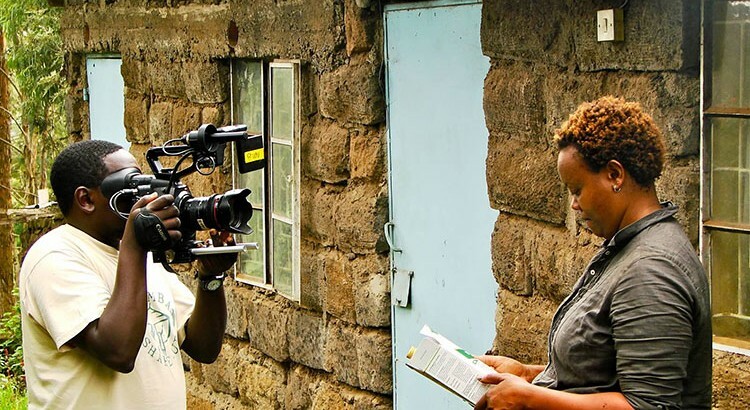 Shamba Shape Up is a reality style TV show designed to educate East Africa’s rapidly growing rural audience. The make over style show aims to give both farmer and the audience the tools they need to improve productivity and income on their farms. Each week the Shape Up team visit a different farm in a different area of the country. The team includes the film crew and a number of experts from partner organisations who specialize in the topics to be covered in the episode. The core of the series tackles issues surrounding livestock, poultry, crops and soil fertility. Other relevant topics include financial planning, solar power and harvesting rainwater. The series is also supported online with a popular Facebook page which has around 44,500 fans, a Twitter page which has nearly 3,000 followers, a YouTube channel, and recently, a blog and Instagram. The interaction on the Facebook page is pretty impressive. As well as online, viewers without internet or power can SMS a database and ask for information in the form of leaflets. These leaflets are posted to people free of charge once they SMS asking for them. So far 250,000 have been distributed. Recently, Shamba Shape Up has moved to mobile, with the starting of iShamba. iShamba is a mobile information service, which gives subscribers access to a call centre, SMS service, weather reports, farming tips and deals or advice form commercial partners. Katharine MacMahon, Communications Officer for Shamba Shape Up said “The social media has been a great tool for us, with our Facebook page becoming a hub for farmers to get advice from either us or from other farmers on the group. We run regular competitions with our partners help, and also invite people to send in photos of their farm and get involved in discussions. In general, the Facebook page is farmer-focused. In comparison, the Twitter page, which is much smaller, has more of a partner-focus. We interact with our partners and the information they have to offer much more on Twitter, with more of a complex nature (on the Facebook page, posts must not have words which are more than 7 letters long – keeping it easy to read for farmers who may be less educated). The show is on TV in Kenya (4 million viewers), Uganda (2 million viewers) and Tanzania (4 million viewers). 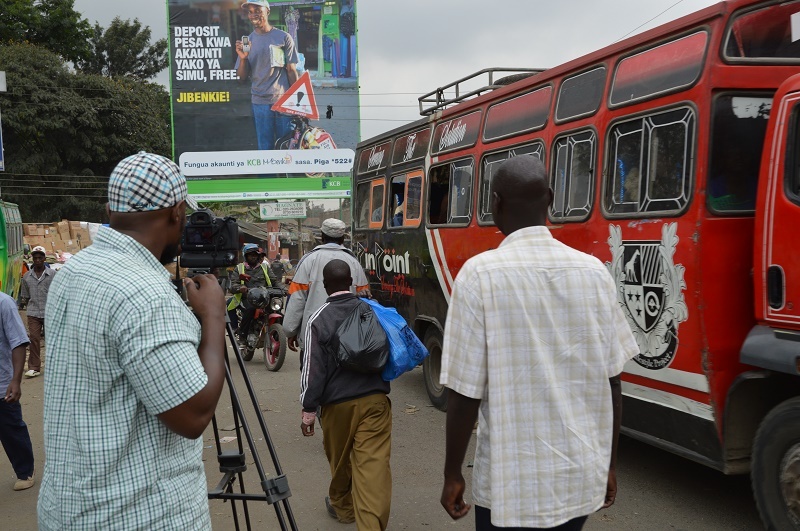 It was started in 2008, and became Kenya’s reality style TV show. It is the third “edu-tainment” production created by Mediae. Just over a year ago I met with the digital team at DFID for the first time and wrote a blog critiquing their use of social media. At that very first meeting we briefly discussed the possibility of our students working on a project as part of the MA Media and International Development that I teach on. Last week after several further discussions it become a reality and I visited DFID with 7 students to start a consultative process. The students will be auditing DFID’s social media outputs and also considering their use of photography and informed consent. We had an intensive day of meetings with various member of the digital team: Marisol Grandon (Head of Digital), Simon Davis (Senior Content Editor), Russell Watkins (Photography Editor), Jess Lea (Girls and Women Digital Lead) and Ricci Coughlan (Digital Editorial Designer). It was an absolutely fascinating day where we learned a great deal about content generation for their social channels. In my blog post just over a year ago, Marisol and I discussed the potential for appointing a graphic designer in the team and the desire to produce more engaging content. I was delighted to hear that about 3 months later Ricci was appointed on a secondment from another government department. In Ricci’s presentation I was blown away by some of the infographics that he had produced over the last 9 months. Talk about a successful appointment. As I said in my previous post, images and infographics can be highly shareable and I want to share some of their recent successes. 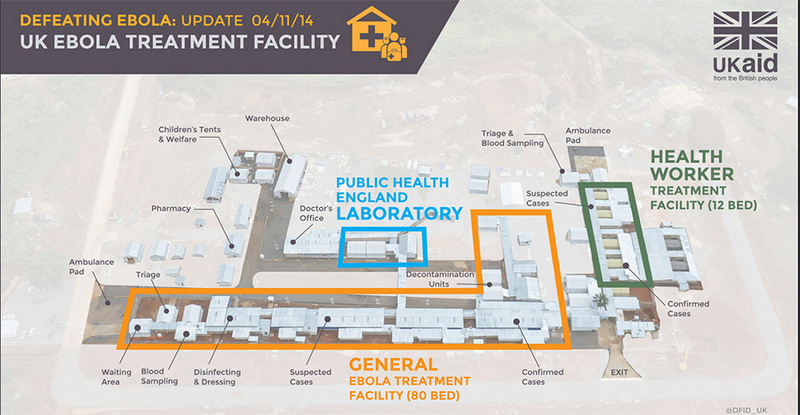 The first infographic I want to introduce is a birds eye view of the first British Ebola treatment centre in Sierra Leone. It is a fantastic example to show the power of social media to strengthen stakeholder relationships. The infographic has been widely shared including tweets from the Foreign Office, Ministry of Defense and Save the Children. It is important for multi-lateral agencies such as DFID to engage with new audiences. I’m sure many of Save the Children’s followers also follow DFID but I wonder how many followers of the MoD’s twitter account also follow them? How many of them have started following them as a result of this retweet? The infographic was also lifted and posted on the Mirror website. More exposure to an audience that might not be aware of DFID’s work.Below is another example of how content created by DFID was used on the UN’s Twitter channel. I asked the team if social media had helped improve relationships with other organisations. They said that they regularly receive or send direct messages to other organisations to share and promote information and that this had undoubtedly improved relationships. I don’t know why I’d never thought about this more deeply before. To me, as an individual, social media and particularly Twitter has been an invaluable tool for networking and this is equally or maybe even more important for global organisations who share similar goals or values. It’s hard to put a value on this but I hope senior managers appreciate how immensely important this kind of networking is in a digital age. My favourite infographic from DFID is a series of 8-bit pixel designs which were used to raise awareness of the girls summit which was held in the summer. This style seems to resonate with other DFID supporters as it was highly shared on Facebook. Maybe DFID followers on Facebook are a similar age to myself and therefore the use of a retro style appealed to them. Maybe it was the subject matter? Post by DFID – UK Department for International Development. Infographics can be very succinct with their message or very detailed. DFID have experimented with several approaches including animated gifs, videos and quotegrams too. I’m not particularly a fan of quotegram and animated gifs and looking at shares they are not so popular with other audiences, but I applaud DFID for experimenting with different mediums. The video style infographic below however, is detailed and has had a good number of views. Although infographics have the potential for sharing, they take a long time to research and produce and do not always engage with the public. Using an agency to produce these kind of graphics can be costly so having an in-house designer who is proficient in these skills can be a more cost effective approach. But, it doesn’t always work. On the whole I’m a big fan of the infographics produced by DFID. It would be good to measure the overall reach that these graphics have had. I don’t have time to do that at the moment, maybe the student group will in their analysis. You can view and assess the infographics for yourself as they are available in a dedicated Flickr group. I hope you find them interesting. Twitter, if managed properly, is an excellent tool for customer service and reputation management. Oxfam’s use of Twitter in January is a perfect example. I was looking at their stream earlier today to find information about a recent video when I noticed a number of tweets about Oxfam hosting an event with somebody who is considered a racist. Oxfam had replied to everyone. This intrigued me, so I favourited all of the tweets and when I got back to my office decided to write this blog. Unfortunately my manic favouriting had obviously alerted Oxfam that these tweets were still in their stream and they deleted them before I could take any screen shots. But fortunately for me I was able to track down one of these tweets via a Google search. 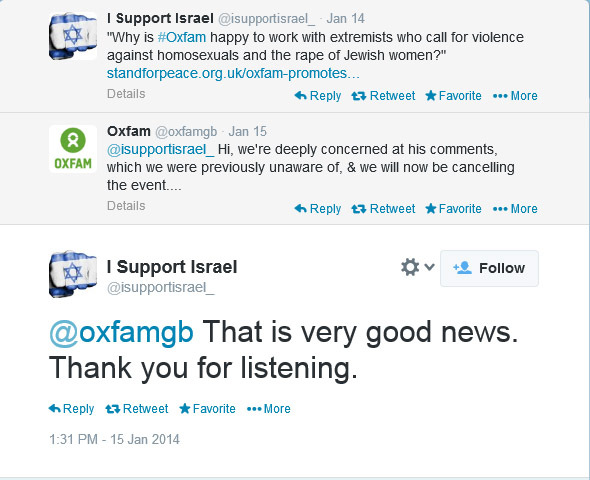 As a result of @isupportisrael and a number of other Tweeple, Oxfam decided to cancel the event and were able to minimise any further negative discussions. A perfect example of reputation management. In January, Oxfam tweeted 159 times (even more before they deleted the tweets I mentioned earlier). Of these 159 tweets, 40 were retweets and 18 included pictures. Their management of Twitter is excellent with a variety of tweets about research, survey results, retail discounts, event promotions, sponsorship appeals, videos, infographics, photos etc. They are really good at building a community by answering direct tweets and also scanning the Twitterverse and communicating with people who have helped Oxfam with its cause through activities such as fundraising or donating clothes. Their most popular Tweet in January with 266 retweets is interesting as they had posted the same information, but with a different angle twice earlier that day. This proves that it is very worthwhile repurposing the same content at different times of the day. On the last and most popular tweet, they asked people to retweet. Is it really that simple? Read some of Dan Zarella’s research if you want to find out more about the science of retweets. In just one months worth of tweets there’s load of other interesting stuff to analyse such as Oxfam’s use of celebrities lilke Stephen Fry, Lauren Lavern, Zoe Ball and more importantly the accepted resignation of Scarlett Johannson as a global ambassador. Maybe another day….